The Cliff Recognition Sculpture gives a German Shepherd Dog owner the ability to recognize their trusted friend and lifelong companion while raising funds in support of diseases affecting the German Shepherd Dogs. This is a wonderful way to memorialize your special dogs and raise funds in support of research of genetic issues and diseases that affect the German Shepherd Dog. 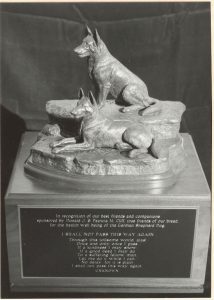 The idea for the sculpture was proposed by Don Cliff, a strong supporter of the Foundation and the breed. After Don’s death, his wife, Pat Cliff donated the statue in his memory. The owner makes a deductible $150.00 donation to the Foundation in the name of a German Shepherd Dog. There are no special title or award requirements. The dog’s name and the owner’s name(s) will be engraved on the statue. The sculpture will be displayed at our National.